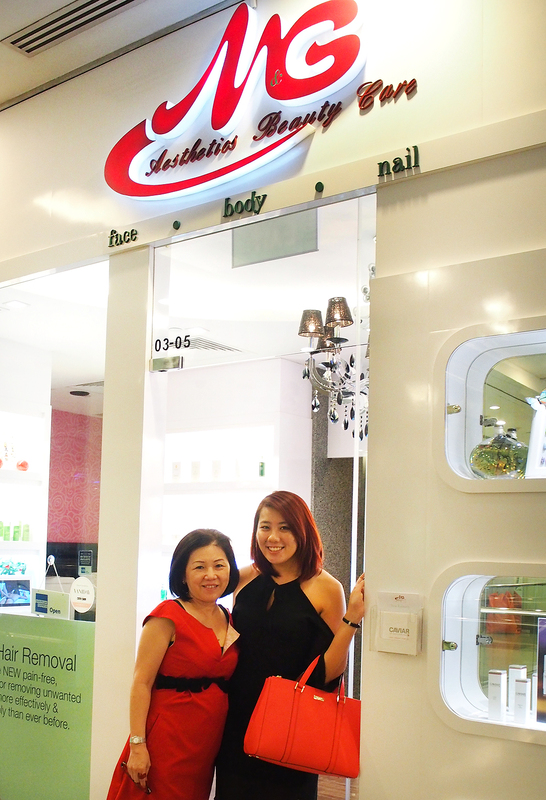 Recently, I popped by M&G Aesthetics at Pacific Plaza for a pamper session. Located strategically at Orchard Road, it is truly a hidden gem and I was surprised that I have not heard of them before. After chatting for bit and finishing up my welcome drink, we headed over to do a skin analysis to determine the best course of action for my skin condition and requirements. 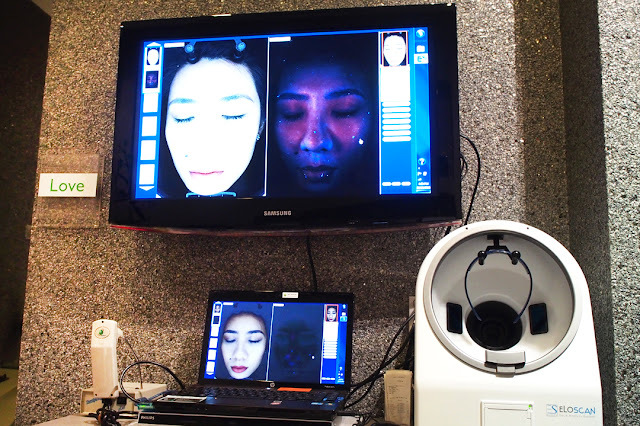 I have quite a few sessions of skin analysis before but what I particularly liked about this session was the ability to see both the top layer and deeper layers of the skin (so that I can really see the issues that are going on beneath the skin surface). Like the results of the other skin analysis sessions, my skin is combination (oily T-zone with pretty much normal skin throughout) and my main issue has got to be clogged pores and rough skin texture. Ever since my allergic reaction, my skin texture has never been the same and I am s-t-r-u-g-g-l-i-n-g. It does not help that I am pretty much full on glam everyday too, as makeup usage tend to clog up the skin if not removed properly. I mean I do a thorough cleanse on most days, but then again there are days I just trudge home and do a slip-shot work of cleansing. To help improve the issue of my clogged pores and skin texture, I was recommended the DiamondTone Microdermabrasion, which utilises micro exfoliation that aids in the removal of the topmost layer of the skin. I know it sounds painful, but it actually wasn't. This basically involved the gentle polishing the skin with natural diamond chips and the vacuuming of exfoliated skin cells. You know how we vacuum carpets and all the dirt and grim gets sucked out? This is pretty much the main idea. This is the ultimate exfoliation, and it helps to treat blackheads, whiteheads, scarring and clogged pores as it enables the skin to breathe better and for better absorption of products and following treatments. When products are better absorbed, that's when the effects start to show. You can be using skin care products with a hefty price tag, but it would not make a huge difference if your skin isn't absorbing much of the beneficial ingredients. After micro exfoliating half of my face, I can see that the skin looks brighter and firmer (due to the countouring motion that the therapist does while "vacumming" the skin. This is gross, but you can see all my dead skin cells on the cotton pad on the right. 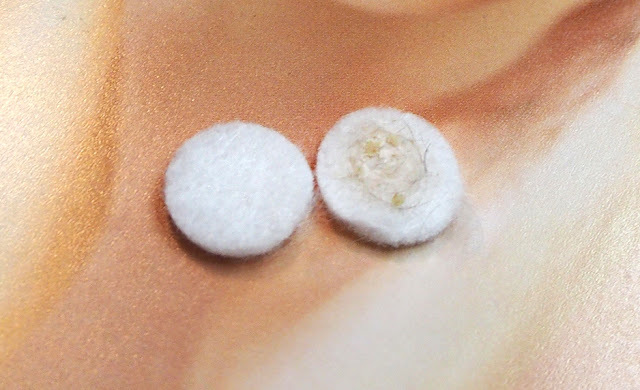 New cotton pad on the left for comparison! 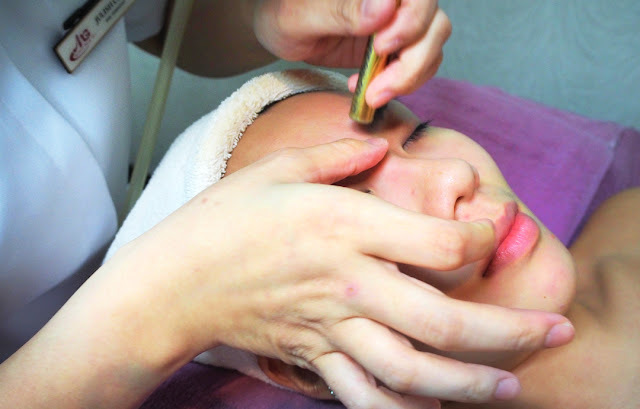 As I also suffer from pretty nasty dark circles (the brownish kind - tones which many concealers and even correctors fail to cover), I was also recommended the Eye Remodeling Treatment using radio frequency. Radio frequency (RF) energy is used to heat up the skin tissue and to stimulate subdermal (below the surface of the skin dermis) collagen production. 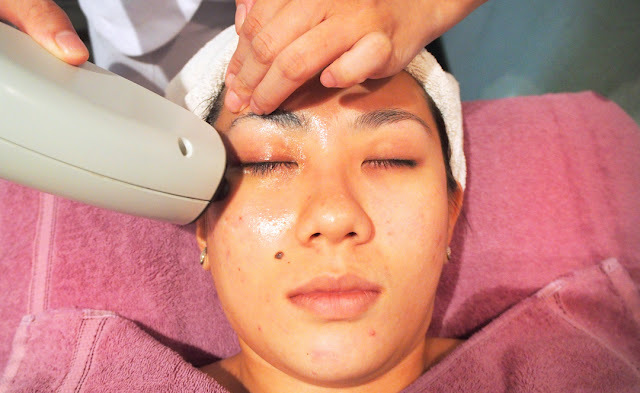 This deep tissue heating results in the tightening of the skin by stimulating it to product more collagen. Some what like non-invasive botox, if you will. Dark circles are caused by the thinning of the skin around the eyes (which is already thinner than the skin on the rest of the face) or tissue loss in the undereye area. I blame genetics for mine, but I suppose my tugging it (gently, I must say) every night to remove my eye makeup does not make things any better. And yes, 3am nights staring at my kids' essays does not either. With the production of collagen under the eyes, it helps to replump the eye area and thus, reducing the darkness that is peaking through. Many aesthetic centres utilises only unipolar machines (a deeper penetrate of RF energy) which works on underlying tissues. As these tissues are deeper down the skin, effects do take a period of time to show. I know, as I have done this before. 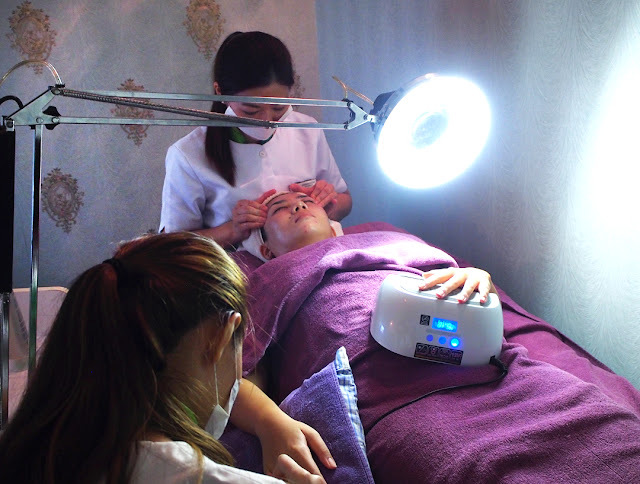 Here, there is also a bipolar machine being used, where the RF energy penetrates less deeply into the tissue so effects are more immediate and are commonly used in facial tightening procedures. Alright, enough with the science-y stuff. Let's move on my experience. 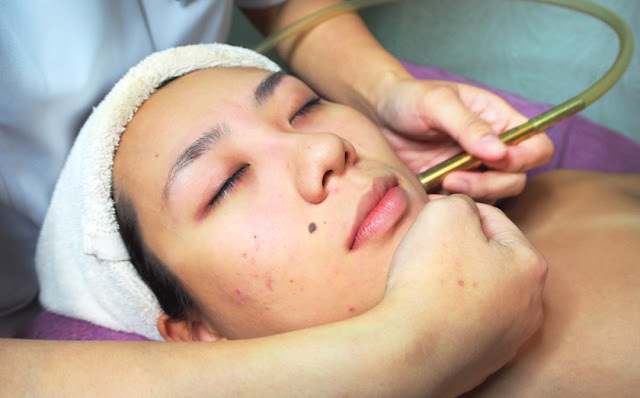 Throughout the treatment, the therapist utilised an in motion technique - where she does not stay in one spot at any one time - to help stimulate blood circulation as well. 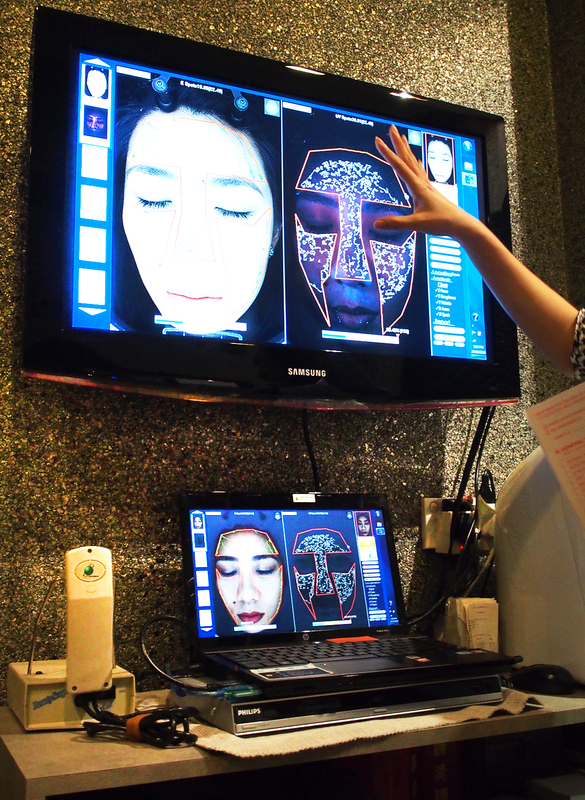 We started off with the unipolar machine, where I could feel the heat being generated from the deeper layers of my skin. It was, for the most part, comfortable except for certain areas which hurt a little as my bone was closer to the skin surface (such as my cheekbone and temple area). Taken after both sides have been done! The dark circles do look slightly lighter and you can see that my brows are looking pretty uniform! After this, I did notice that my forehead and brows looked way more uniform. My left brow was higher than my right - I know, filling them in ain't the easier nor fastest step in my makeup routine - as the left side of my face is pretty much immobile, so less muscle movement and I'm assuming, less sagging thanks to almost zilch expression. I was pretty impressed by how immediate the results were! I also noticed the my undereyes were slightly plumper and the lines underneath looked less noticeable. Let's hope it lasts for a while as I can get used to this. A recommended minimum 3-5 sessions should be done to achieve best results. 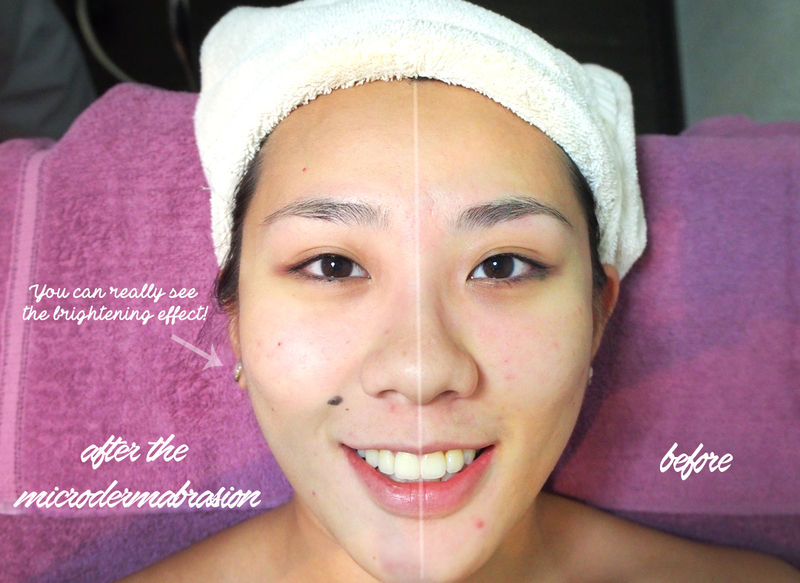 Following the Radiofrequency treatment, we proceeded onto a facial massage. The best thing? 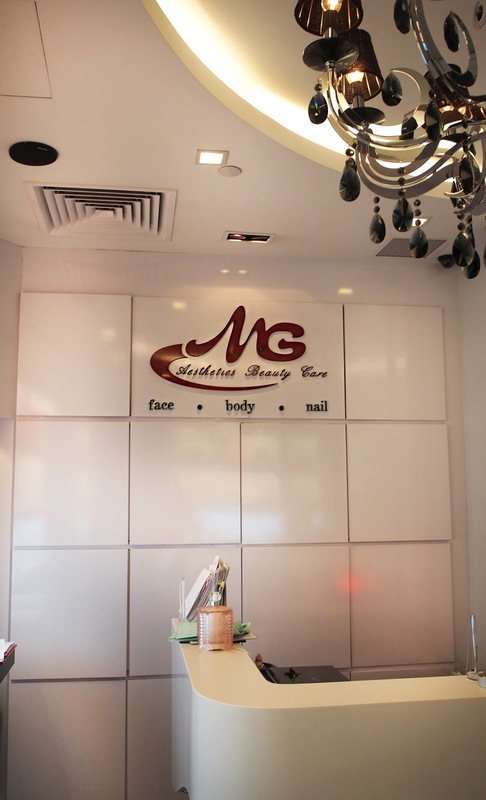 M&G also provides manicure services while doing your facial treatments. So I got to get my gel nails on while enjoying my facial massage. This was absolutely lovely and boy, was I enjoying myself. 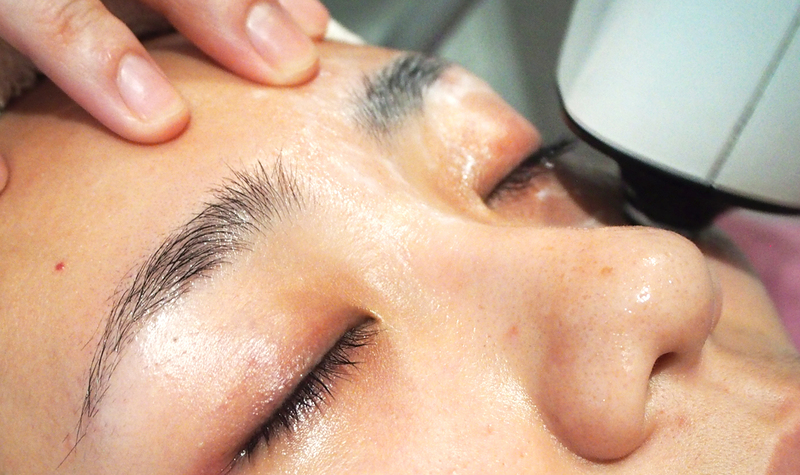 The facial massage was great, with the right amount of pressure and hitting the right points. Next, we proceeded to apply EmerginC Apple Stem Cell Mask (EmerginC is a cosmeceutical brand from the USA). This is a natural marine-based peel-off mask that is supposed to rejuvenate, tone, repair, protect, reduce the appearance of fine lines and wrinkles, brighten the skin while calming and soothing it at the same time. That was a mouthful, but my skin did look pretty tight and bright after. And if you're wondering, yes I was still getting my manicure done. Talk about multi-tasking! 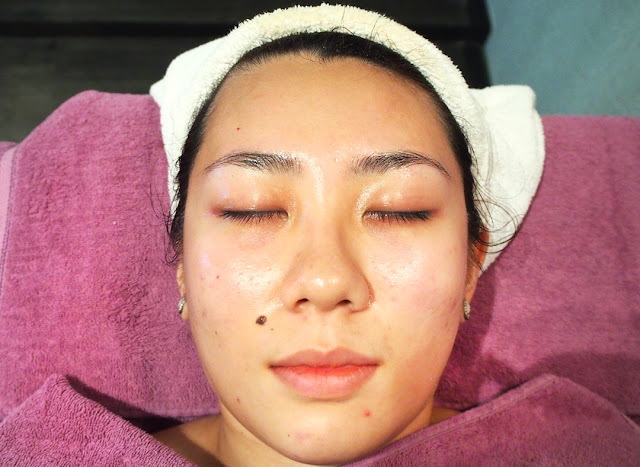 After the mask had been removed, the therapist applied the EmerginC Swift Lift Serum (to help firm and hydrate the skin, while diminishing the appearance of fine lines and wrinkles) and the EmerginC Complexion Control Moisturiser (to hydrate, control excess oil production and control breakouts). Apologies for the blur image! But here, the manicurist was focusing on the details for the nail design. I just had to wait a little before my gel manicure was completed and I was done. 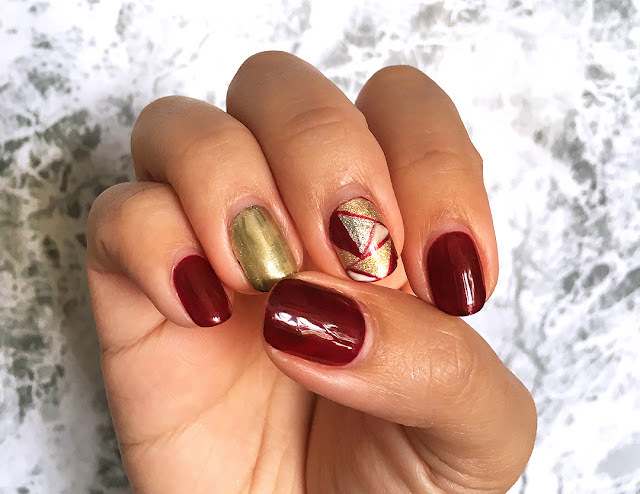 Love how the nails turned out! Taken a few days after so my nails did grow a little! This is really a one stop beauty centre to get your face, body and nails done all in one go. I foresee this being a great option for ladies (or gents, I don't judge) with a busy schedule as ain't nobody has the time to be hustling to different places for the various services. I am really a fan of this idea. 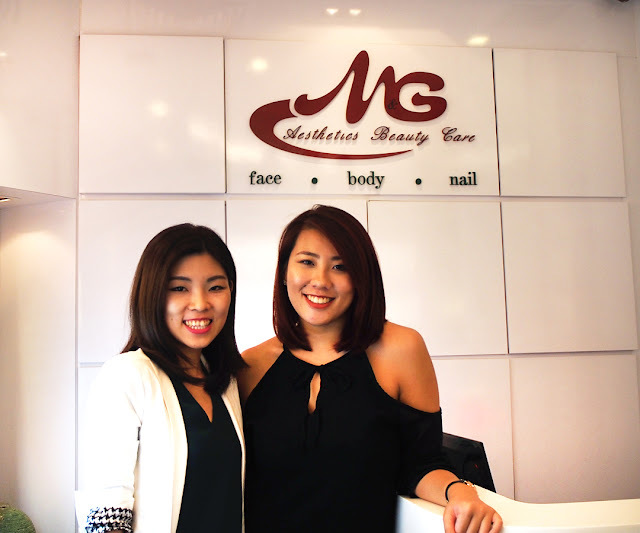 Being established in 1982 and in the business for 34 years now, M&G Aesthetics only has one flagship centre to focus on its quality and standard. I met the owner and she even helped me with the RF modelling and a little extraction! Talk about a personal level and I appreciated that. Overall, I thoroughly enjoyed myself. The therapists were friendly and they made me feel welcomed and comfortable. As a person who constantly suffers from clogged pores, I did find that the micro exfoliation did a great job of exfoliating my skin in a way that no physical scrubs can. 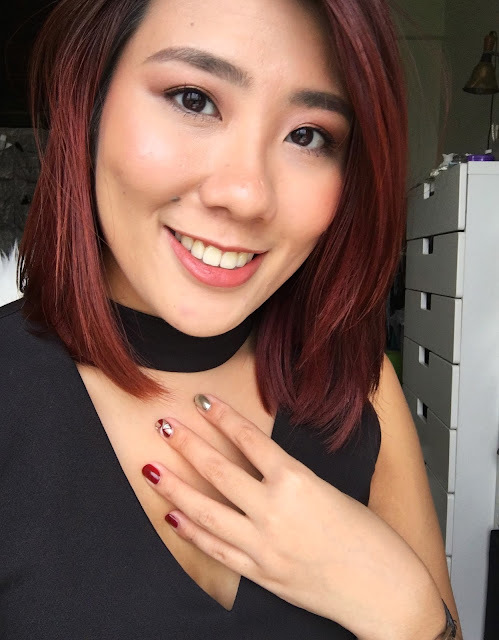 If I had to really choose an aspect that I enjoyed the most, it has to be getting my nails done concurrently with the facial treatments. Being an avid multitasker and hustler, there is nothing more I appreciate than getting two or more things done at once. Nothing frustrates me more than waiting for my nails to dry (and being paralysed, basically) so this was lovely how there was no time wasted at all. M&G Aesthetics can be found at Pacific Plaza (besides Isetan and opposite Scotts Square), #03-05. 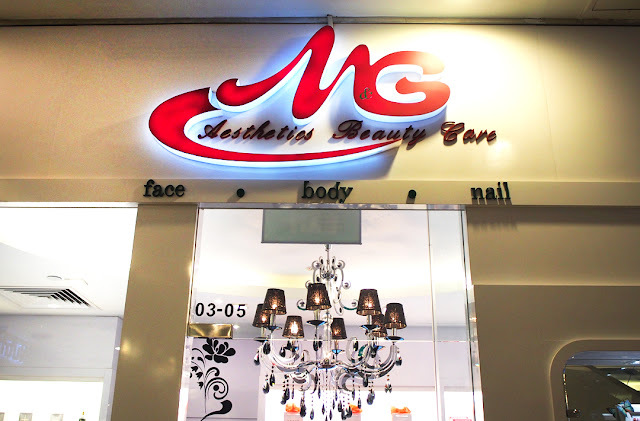 For more information on the services available, you can check out M&G Aesthetics' main website or their Facebook page. 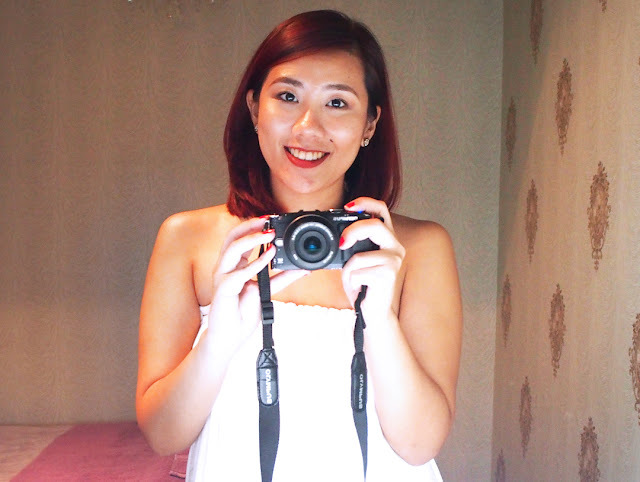 The most obvious effect for me has got to be the texture of my skin from the microdermabrasion. 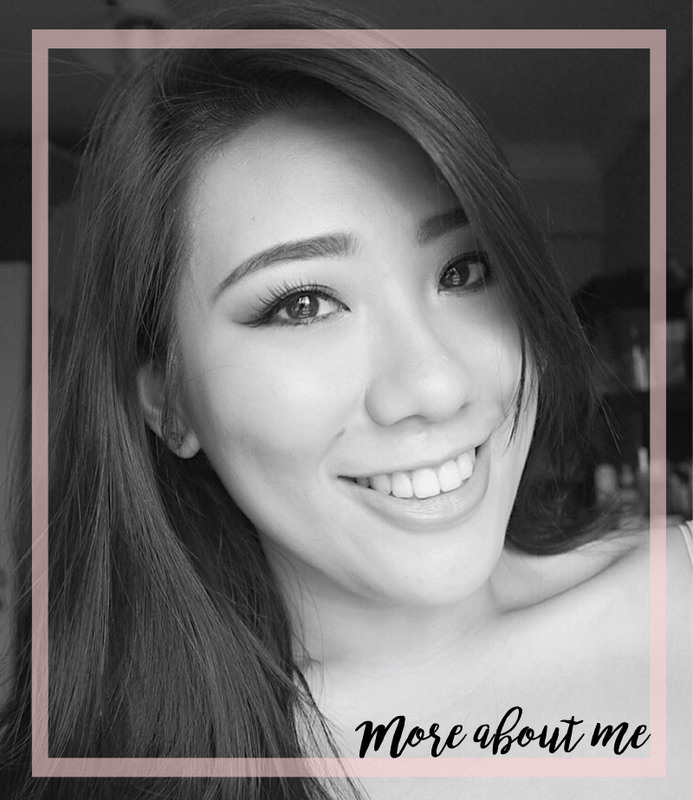 I realised that my foundation went on way smoother on the days that followed my treatment. If you are interested, simply quote my name and you get 50% off all face and body treatment services for first time customers! Disclaimer: Treatment session was sponsored by M&G Aesthetics for review consideration. I am not affiliated to the brand. The above review is based on my true and honest opinion and it also contains information from the brand itself.